A train lover takes the bus: Can’t beat the price for BOS-NYC bus, but what about the user experience? 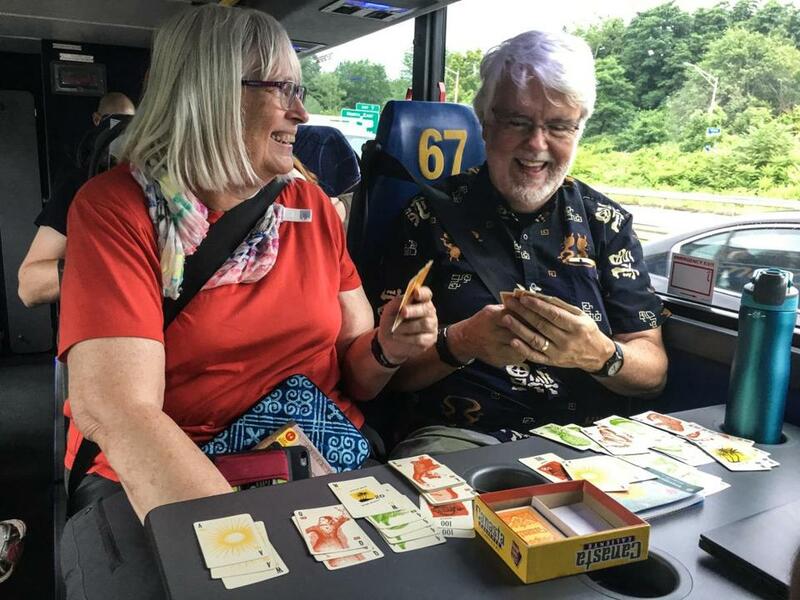 The author and his wife, Carol, tried out the Megabus to New York City. Planning a brief getaway to Manhattan recently, I researched round trips on Amtrak’s Northeast Regional, about a week in advance, and couldn’t find anything cheaper than $171. Then I checked Megabus, one of several bus lines servicing the BOS-NYC route, and found I could get down and back for a $34 fare that included a booking fee of $2 (recently hiked to $2.50) and the $3 premium upgrade of a table with cup holders! Less costly options were available by booking further in advance — as cheap as $1 each way on Megabus (plus the booking fee) and $49 on the train. But an autumn departure didn’t exactly fit our summer plans. As much as Amtrak remains the workhorse on the BOS-NYC route, claiming more riders between the two cities than all the airlines combined, travel by bus is growing. Annual departures for New York from the South Station Bus Terminal are up 7 percent over 2016, approaching 100,000 for fiscal year 2017. I love travel by train, especially the route that Amtrak traces along the Connecticut shoreline. But it was time for my wife, Carol, and me to forsake scenery for savings. A few days before departure, our bet on the bus was looking even better. The governor was referring to track repair at Penn Station, a project expected to render an already crippled transit hub even more tortuous for the two long months it would take to complete. Suddenly, opting for the bus — with drop-offs at curbside in Manhattan rather than Penn Station — was morphing into a stress reliever as well as a money saver. Travel choices are never just about the money, of course. The user experience — comfort, safety, on-time arrival — gets all mixed up with cost to beget a decision often driven as much by whim as evidence. Our first round trip on the bus left me on the fence about abandoning my lifelong preference for the train. So a couple of weeks later, I spent a day evaluating the bus by riding the train as well as the bus — outbound on Amtrak’s 11:15 a.m. Northeast Regional and home on the 5:40 p.m. Megabus from 34th Street. The conclusions I’ve drawn from these rides — three by bus, one on the train — are all subjective, reflecting my own experiences and biases. We knew, before buying our bus tickets, that the ride would be more cramped than we’ve experienced on Amtrak’s wider, softer seats. But especially on an express run with no scheduled stops and a toilet on board, we figured: How bad could it be? Turns out there are some additional trade-offs involved in that premium bus seat. The carry-on space is tight (no room for overhead luggage on a double-decker bus) and we shared legroom with the two New Yorkers who bought the premium seats on the other side of the table. Nate Suggs and Rick Raven turned out to be amiable tabletop seatmates, graciously tucking their laptops into their midsections to accommodate our sprawling Canasta card game. And while the arrangement was not designed for backpacks at our feet, we did find storage on a shelf just across the aisle. But comfort is not simply a matter of roominess. I believe there’s something soothing — comforting, even — about moving really fast along a fixed track as opposed to moving really fast along the less certain pathways of a bus. Speaking of safety, there have been enough accidents on both trains and buses in recent years to remind us that any ride in any vehicle could be our last. But it’s worth noting stats showing that, apart from motorcycles, the most dangerous way to get anywhere is neither a bus nor a train but a car. Even before the federal government began requiring seat belts on all new buses last year, Megabus provided the option of buckling up. It’s a welcome if obvious feature I’ve encountered only occasionally on public transport not hurtling across the sky. Less welcome was the occasion to need it. About an hour and 15 minutes out of Boston, our bus came to an abrupt stop in the breakdown lane of the Mass. Pike, sending our phones and water bottles skittering across the table at Nate and Rick. In response, the driver said nothing but began backing up, never a reassuring maneuver for something as big and bulky as a bus on a busy freeway. All good. How about one more: Don’t miss your exit! For the bus portion of my next trip, I splurged again for a premium seat — this time spending seven bucks for a front row seat upstairs. In the window seat next to mine on the aisle was an IT specialist making his first bus trip after driving tens of thousands of miles between the two cities over the past seven years. After a minor accident on his most recent trip by car, he decided to try the bus. Before buying his ticket, he researched intercity bus accidents, the results of which he shared in detail as we barreled toward an overpass I hoped fervently would turn out to be higher than the roof over my head. Our driver, introducing himself before departure with an entertaining schtick reminiscent of Southwest Airlines, pledged to get us to Boston safely. But he made no promises about when that might happen. Which brings us to our final category: On-time arrival. Our first trip on Megabus left the South Station Bus Terminal right on time at 10:30 a.m. and deposited us on 7th Avenue just a half hour late at 3:15 p.m. — comfortably within a margin of error I’d expect in Manhattan traffic. The ride home three days later was rougher and longer. Stormy weather and bad traffic had me peering through rain-smeared windows at a sea of brake lights that swamped our on-time arrival by 90 minutes. During a Burger King rest stop on my next ride, I asked the Megabus driver about our ETA in Boston. “I’ll have you there by 11 o’clock,” he said without reference to our 9:55 p.m. scheduled arrival. Asked about the 4 hour and 15 minute trip time advertised on Megabus.com, corporate affairs director Sean Hughes said he’s not sure how often his buses arrive on time. He described the published schedule as “realistic,” and pointed out that competitors list similar trip times. “Our first priority is safety,” he said in a telephone interview, noting that drivers are given the discretion to stop for a rest whenever they feel they need it — and that there’s no accounting for traffic and weather. Amtrak promises a journey of about 3½ hours on its higher-priced Acela trains and just over four hours on the Northeast Regional. My train — Number 173 — departed precisely on time at 11:15 a.m. and glided to a halt at Penn Station no more than five minutes late. Amtrak says its Northeast Regional trains arrived on time (defined as no more than 20 minutes late) 80 percent of the time through the end of May. Train 173 hasn’t performed as well, with an on-time percentage of 71 percent for the July 2016-June 2017 period and just 36 percent in June. Queuing up to disembark the train, fellow passenger Robert Cornell told me that he and his family, visiting from Iowa, had been warned that repairs would leave Penn Station “a wreck” for travelers this summer. Emerging from the tracks into the station, we spotted no sign of the chaos envisioned by the governor. Me, too. Especially at $49. Bill Mitchell can be reached at bmitch@gmail.com.